We're back! Like a phoenix from the ashes, Bloodhound has risen anew, looking better than ever. After 10 years of cutting-edge research and development, building and testing the world's most advanced straight-line racing car, the old Bloodhound company finally ran out of money at the end of last year. Despite some serious commercial interest in the project, the stop-start nature of sponsorship funding finally did us in. With literally just a few days left before Bloodhound went to the scrap yard, a lovely Yorkshireman called Ian Warhurst stepped forward and bought the car. It was the middle of December last year when Ian turned up with the best Christmas present ever - a supersonic future for Bloodhound! Ian is a mechanical engineer and, having just taken early retirement after selling his business, was looking for something to keep him busy. A new World Land Speed Record seemed like just the thing. 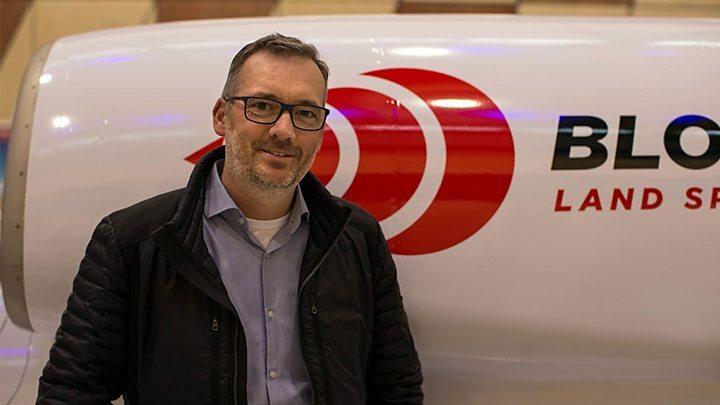 Media captionIan Warhurst: "My kids kept saying I should buy a fast car, so I bought the fastest"
The new team is called Bloodhound LSR (for Land Speed Record, of course) and the look of the car has been totally changed by its striking new red and white colour scheme. The first time I spoke to Ian, he asked me what colour I thought the car should be. I suggested some strong primary colours, such as red or blue, which would stand out against the dried mud surface of the desert track. Almost as an afterthought, I mentioned that a base colour of white would also be OK, as it was the best colour to keep the car cool in the sunshine, but it wouldn't be my first choice. I'm SO glad that he didn't listen - the white looks just terrific. Very sensibly, Ian has broken the new "operational" phase of Bloodhound's life into two distinct parts. The first target is to set a new World Land Speed Record (currently standing at 763mph), after which we can review the results and make a plan to attack Bloodhound's ultimate goal of 1,000mph. In preparation for our first target of a new record around 800mph, we want to take the existing car out to South Africa to conduct some high-speed testing. "High speed" in this context is anywhere north of 400mph to 500mph, which will allow us to assess aerodynamic performance, measure the interaction of the solid metal wheels with the dry lakebed/desert surface, test and develop the parachute braking systems, and so on. The next obvious question is when will this happen? Ian's simple answer is: "As soon as possible!" The first task is to complete the move into our new home at SGS Berkeley Green University Technical College, which is near Gloucester. The car moved into the modestly titled "UK Land Speed Record Centre" last week (the video is here if you haven't seen it already), so Mark Chapman and his engineering team can begin preparing for high-speed running pretty much straight away. However, there are lots of other things to sort out before we can fix a date for the tests. The track in South Africa is in excellent condition and mostly ready to go. After nearly a decade of work by the local community, under the direction of the Northern Cape Provincial Government, Hakskeen Pan offers us the best-prepared high-speed racing surface in history. Now we have to complete all of the paperwork to use government-owned land in someone else's country. As part of this, we need to provide evidence that we can run the car safely without damaging the local environment. It will help that we've done this before, even if it was over 20 years ago! The South Africans are very keen to get Bloodhound out there on its new track, so they will do everything they can to get the paperwork completed quickly. In some cases, we should be able to use the paperwork we've prepared previously just by changing the name to "Bloodhound LSR", but I'm sure it won't all be that easy. Equally important is all of the export paperwork. It's no real surprise that exporting state-of-the-art military equipment (like our Rolls-Royce jet engine) attracts a lot of attention from the organisations who control that sort of thing. While the regulations controlling international arms shipments were never drafted with the Land Speed Record in mind, we are using military-spec hardware, so they still apply to us! Once all the paperwork is sorted, we can get the car out to Hakskeen Pan and start doing the high-speed testing. For the first batch of high-speed tests, the car will be jet-powered, using a Rolls-Royce EJ200 engine as found in the RAF's Typhoon jet fighters. Without the additional assistance from the Nammo hybrid rocket system (still under development), this jet-only car will not reach supersonic speeds in the 10-12 miles available on Hakskeen pan, but it will easily reach our target of 400mph to 500mph (and maybe a little faster!) during testing. With Bloodhound back on track for a new Land Speed Record, we're all hugely excited about the future. SGS Berkeley Green UTC is an ideal new home for us and the car looks great in its new colour scheme, which is generating a lot of commercial interest in the future of the project. Now our task looks fairly clear. As our new owner Ian Warhurst put it: "It's my ambition to let Bloodhound off the leash and see just how fast it can go." Bring it on.